My father always called his sister Lillian, “Diamond Lil”. When I heard that as a child I pictured a queen dripping in diamonds from head to toe. My imagination played all sorts of sparkly scenarios through my head. Dad said she was coming for a visit and I really couldn’t wait to meet her! When he pulled into the driveway after picking up “Diamond Lil” at the airport, my sister and I peered out the big picture window in the living room with great expectation. Slowly a large lady emerged from our 1950 Willys Jeep which, by the way, was hardly the vehicle you’d expect someone with the name of “Diamond Lil” to arrive in. I have to say we were sorely disappointed in what we saw! She looked very ordinary and not at all like we thought a “Diamond Lil” should look. She was rather round in the middle with pink cheeks and short grey hair. During her visit with us I found out those pink cheeks actually turned bright red when she laughed and we ended up laughing a lot with Aunt Lil. Of all the aunts we had met to date, she was without a doubt the most fun. We spent numerous hours with her thoroughly enjoying her company. I noticed she had an impressive collection of rings. She carefully chose different ones to wear each day. Most of these were covered in large clear stones that sparkled when the light hit them. She revealed to us that this was why our dad called her “Diamond Lil”. Weighing the evidence, we felt it quite appropriate. Sometimes she would even let me wear one of her rings for a while and I felt very special knowing that she trusted me with such a treasure. Years later she told us they were all costume jewelry but that still doesn’t dampen my memory of those awesome jewels. When company came to visit it was traditional for Mom to fix big meals using her best china dishes with the pink flowers around the edge. This occasion was no exception. She’d been cooking all afternoon and the table was beautifully set with great care and attention. She called us to help place the food on the table and we grudgingly stopped playing and went to work. I remember I was eyeing the mashed potatoes and gravy I had just set down when I heard a fluttering of wings. I turned to see Pretty Boy the parakeet coming in for a landing. He made a direct hit in the scoop neck of the china gravy boat! The bird was squawking and fluttering and mom was yelling and the rest of us were hysterical with laughter—-especially Aunt Lil. Pretty Boy flew off splattering gravy around the room as he went. Mother was totally mortified. She reached for the gravy boat to throw out its contents but Aunt Lil quickly interceded. Being a lover of food and no perfectionist, Lil saved the day telling mom, “There’s nothing in the world wrong with that gravy. Let’s sit down and eat.” Mom protested but Lil insisted and she and my dad exchanged a wink. That was one of our favorite stories to reminisce about when we got together years later, and it still brings a smile to my face. Aunt Lil has long since passed from this life but she left a sweet legacy of fun and laughter I treasure to this day. I saw this article earlier today and decided to grab it with the “Press This” app. This is one of those things that make you stop reading with a “did I read that right..? ?” and go back and re-read more carefully just to be certain. It so happens that I did read it right……and I still can’t believe it. This is an example of what is wrong with our health care system here in the U.S. I am not going to make this about politics. We are all certainly aware of the political turmoil, strife, innuendo, etc. that is flowing freely from both donkeys and elephants. Your own political bent aside…can you imagine what this would feel like if you were the patient? Sort of a giant sucker punch to the old solar plexus wouldn’t you say..??? I have to ask…Was the patient aware of this before the procedure? She claims not… Was the patient in grave, imminent danger?? Hmmm, I didn’t think scorpions in the U.S. were usually considered to be dangerous to humans. 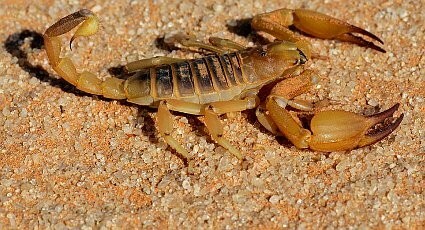 One of the sources I looked up claims no one has died of a scorpion sting in the U.S. in more than twenty years. Yes, I know that people die from scorpion stings occasionally. World wide, it happens many times every year. There are several species that are quite large and dangerous. Thankfully they live in Africa and other regions far away from the U.S.. Yes, there are one or two species in the U.S. that have the potential to be dangerous to humans, and one of them actually lives in Arizona. So, it COULD happen. But people also die from spiders, bees, wasps, and of course snakes…..and a lot more frequently than once every twenty years!!! In any event the following is a “Press This” share from CenturyLink and the Associated Press. Take a few minutes, read it, and tell me what you think. The full text of the article is at the link at the bottom. Phoenix (AP) — An Arizona woman is wondering what hurt more: getting stung by a scorpion or seeing her hospital bill after treatment. Marcie Edmonds says the bill from Chandler Regional Medical Center was more than $83,000. That includes two doses of anti-venom at nearly $40,000 per dose. The Arizona Republic (bit.ly/RD6bX8) says Edmonds’ insurer has paid more than $57,000 and the suburban Phoenix hospital is asking Edmonds for the balance of about $25,000. via Scorpion sting leaves Arizona woman with huge bill – CenturyLink™. Over the past few weeks I have been giving some carefully considered thought to adding a guest author to my blog. I think initially it will seem different to me, but I believe it will work out well. I think my blog needs an infusion of supplementary thoughts. I currently have something on the order of five blog entries almost complete and several others in various states of preparation. While reviewing them for release, I realized how similar a lot of my posts have become. That’s not necessarily a bad thing, you understand. You are frequently remembered for your ideology or your “slant” as much as for your content…..So I’m not complaining. I just wanted to freshen it up a little and provide a bit of different style material for your perusal here. So, let me introduce my first guest author. Marilyn is a wonderful lady and a great mom. She hails from Arizona and currently resides in the wild west state of Tejas (that’s Texas to all of you English speakin folk..!!!) I have known Marilyn for many years and can say without any qualms that she can write! She writes a little for a newspaper and is currently caught in the throes of getting a manuscript ready for publication for a historical association. That along with being a focus individual for a current naming/renaming issue down there (Texas..) gobbles up a lot of her time. Somehow I managed to convince her to contribute here in this space once in a while. My current sense of all of this is that this will be a drop by and post something every so often. She has full access to my blog, so you could see something at any time and then it might be….who knows….when the next post will show up. I happen to know that her first blog post will be appearing soon….real soon!! In any event, I thought I would introduce you to each other because you definitely will not recognize her stories as something I would have written. Oh, I almost forgot, Ms. Marilyn is my niece! I hope you enjoy what she writes. I know I do! !